Wildfires have charred a whopping 2 million acres across the U.S. so far this year, an area larger than the state of Delaware. 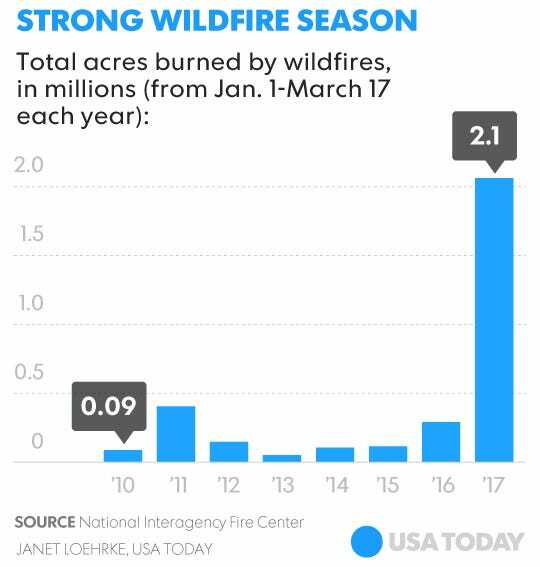 It's a gigantic number for so early in the season, roughly 10 times the average and also the most acres burned as of mid-March since 2006, according to spokeswoman Jessica Gardetto of the National Interagency Fire Center in Boise, Idaho. Many of the blazes have been massive grass fires in Oklahoma and Kansas, which have both set records for number of acres burned in March, Gardetto said. In parched Oklahoma, drought conditions now encompass three-quarters of the state, the U.S. Drought Monitor said. Oklahoma City has received a paltry 0.01 of an inch of rain so far this month, the National Weather Service said, which is less than 1% of the city's typical March precipitation.